When a client visits an architect they should present an outline of the builing they wish see on print. Often people will have features and room sizes in mind but there is also a lot more to think about if you want the architect to design a building that is functional, beautiful and cost effective to inhabit. Some of the things that should be taken into consideration. Position on site – in cases where wind turbines are a consideration (permitted distance from boundaries and buildings must be adhered to) and in cases where ground source heat pumps are a consideration (important when a horizontal ground loop is being used). Materials used for construction – different materials will allow for different design considerations. 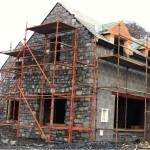 e.g hemp/lime builds, concrete builds, timber frame or log cabin style builds.